Whether your sewing machine has a buttonhole feature or you want to sew a buttonhole by hand, this is a task that can seem intimidating to a lot of seamstresses. However, no matter how you choose to do it, this process is fairly simple if you understand the steps and have a few tricks up your sleeve. If you don't have a sewing machine or if you're doing heirloom sewing and want that hand-worked appearance for your project, you can sew your buttonhole by hand. This can also be the best choice if you're working with a really delicate fabric like chiffon or silk charmeuse, since machine-sewing a buttonhole can damage these fragile materials. Determine the size and placement of your buttonholes. To do this, measure the button precisely. You'll need its diameter and its height, including the shank. For flat buttons, the height is often only about 1/8 inch. Add the height and the diameter together to get the length of your buttonhole. It's important to note that you may need to make the hole slightly larger to give wiggle room for your button. You'll need to test the button after cutting the hole and adjust accordingly. 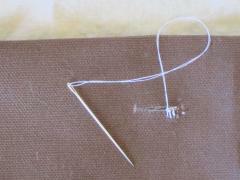 Mark the desired location for your buttonhole on your fabric using a dressmaker's pencil. If you're using a pattern, the pattern will indicate where the buttonhole should go. Be sure to use a ruler to keep your mark straight and accurate. Even a mistake of an 1/8 of an inch can be difficult to correct. You also want to make sure the mark is perfectly straight and positioned at exactly the right distance from the hem of your garment or project. Before sewing your buttonhole, you'll need to cut it open. Note that if you are machine sewing your buttonhole, you'll cut it open after you sew. To cut open the hole, you can either fold the fabric in half and snip it with sharp scissors or use a sharp craft knife to open it up. Your hole must be straight and perfect and no larger than your button. Before you continue, check the hole with a button to make sure it is the correct size. Adjust as needed. Thread your needle, using a double strand of thread to sew the hole. If possible, you should wax the thread to make it stronger. Start by anchoring your thread on one end of the buttonhole, hiding the knot between layers of fabric or interfacing. Now, use a buttonhole stitch to sew all the way around the hole. To make a buttonhole stitch, create a loop with the thread and pass the needle down from the wrong side of the fabric, through the loop, and out the other side. Pull it tight. Repeat this stitch again right next to the first one. Continue adding stitches until you've sewn all the way around the buttonhole. When you reach the end of the buttonhole, make sure you secure the thread. To do this, sew up and down several times, very close to the same spot. Test the thread to make sure it doesn't gather the fabric when you pull it. 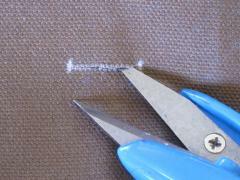 Then trim the ends very close to the fabric. Your buttonhole is done! Most modern sewing machines offer a buttonhole feature, but the way this works depends on the complexity of your machine. You can consult your owner's manual to find out what kind you have or for step-by-step instructions that are specific to your machine. Many new machines, especially those with computerized features, offer something called an "automatic buttonhole." This feature takes all the guess-work out of making a buttonhole, but it's still a good idea to practice on some scrap fabric. It's important to note that some machines have trouble creating buttonholes near seams, since they "sense" that the buttonhole is finished too early. Adjust the machine so that it is set to produce an automatic buttonhole. This may involve manually pulling down a buttonhole lever. Place a sample button into the slot specified by your manual. Often, this slot is on a special buttonhole foot. The machine will use this sample button to make sure the buttonhole it produces is a perfect fit. Attach the buttonhole foot to your machine according to the owner's manual. Place your test fabric under the buttonhole foot and lower the foot. Most machines begin sewing the buttonhole at the upper, left-hand corner of the hole. This means you'll need to pay attention to where you start the buttonhole on your garment. For practice, you can start the buttonhole anyplace on your scrap of fabric. Press down the foot pedal and let the sewing machine complete the buttonhole. Some machines cut the buttonhole open as they go, but you may need to use a seam ripper, a craft knife, or sharp scissors to open it. Test out the fit of the buttonhole by trying it with your button. Mechanical machines, both new models and vintage models, usually include a four-step buttonhole feature. This is a bit more complicated than an automatic or one-step feature, but some seamstresses find that it's easier to produce consistent results with this type of machine because it doesn't incorrectly "sense" things. Locate the buttonhole foot and attach it to your machine. You may also need to pull down a lever located behind the foot. Determine the size of your desired buttonhole. To do this, measure the diameter of the button precisely. Then measure the height of the button precisely. Add these two dimensions together, and then add another 1/8 inch to allow the button to slip smoothly through the hole. Mark the length and location of the buttonhole on your fabric using a dressmaker's pencil. Always create a practice buttonhole on a piece of scrap fabric so you can make sure the fit is perfect. Place the fabric under your buttonhole foot, adjusting it so that your marked line appears in the open area of the foot. Set your machine to the first step of your buttonhole using the associated dial or button. Typically, the first step will be a narrow zig-zag stitch down the left side of the buttonhole. You may need to adjust the stitch width if your machine owner's manual recommends this. Sew a zig-zag stitch down the side of the buttonhole you marked on the fabric. Adjust the machine dial to the second step of your buttonhole. This will sew the bottom end closed. Sew the number of stitches to achieve your desired width. Typically, five to seven stitches will work. Adjust the machine dial to the third step of the buttonhole. This will sew up the right side, going in reverse. Sew the zig-zag stitch up the other side of the buttonhole. The machine should reverse automatically as part of the program; you shouldn't have to hold down a reverse button. Adjust the machine dial for the fourth step to close up the end of the buttonhole. Sew the same number of stitches that you did on the other end, closing the loop. Sew back and forth once to lock in your stitches. Remove the fabric from the machine. Cut open the buttonhole and test it with your button. 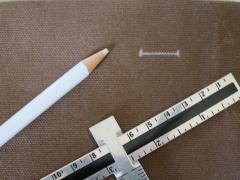 Determine the size of your buttonhole by adding the diameter of the button, the height of the button, and 1/8 inch. Mark your buttonhole on your fabric using a ruler and a dressmaker's pencil. Your marks need to be perfect and straight. Always practice with scrap fabric, especially when you're not working with a programmed machine. If your machine has a buttonhole foot, attach it and perform any other adjustments necessary. If not, use the foot you would normally use for a zig-zag stitch. 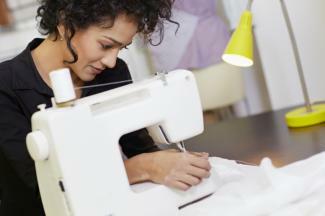 Adjust your machine to perform a very narrow, tight zig-zag stitch. Test this out on scrap fabric until you find the setting that works best for your needs. Starting at the very end of your buttonhole line, sew a zig-zag stitch down the left side of the buttonhole. When you reach the end of your line, lower the needle into the fabric to keep your spot. Raise the foot and turn the fabric 90 degrees. Lower the foot again, and sew about five stitches to close the end of your buttonhole. Once again, end with your needle down. Raise the foot again and turn the fabric again. Lower the foot. This time, you'll sew a zig-zag up the other side of your buttonhole line. When you reach the end, lower your needle. Raise the foot and turn your fabric again, and then lower the foot. Sew about five stitches to close the other end of the buttonhole. Backstitch to secure it. Remove the fabric from the machine, and open your buttonhole. Test the size using your button. Make sure you have everything you need to create a precise buttonhole. This may include a good ruler, a buttonhole foot, needle and thread, a dressmaker's pencil, some sharp scissors, and of course, your button. Having the right tools will help ensure your finished buttonhole is perfect. When you put a buttonhole in any garment or project, you need at least two layers of fabric. This will give the buttonhole enough structure. If you're sewing a row of buttonholes, make sure the fabric underneath has interfacing, even if the pattern didn't call for it. This will give that area of the garment more strength, which it will need because you're pulling on it a lot. For a nicer-looking machine-made buttonhole, go all the way around once, then carefully cut the buttonhole open and sew around again. To cut open your buttonhole without making a mistake, place a straight pin at one end of the hole. Then use your seam ripper to carefully remove the fabric between the edges of the buttonhole. The pin will stop your seam ripper from going too far. Sewing buttonholes can seem frustrating at first, but keep at it. A row of beautifully sewn buttonholes can give your finished garment or home decor project a polished and professional appearance you'll be proud of.